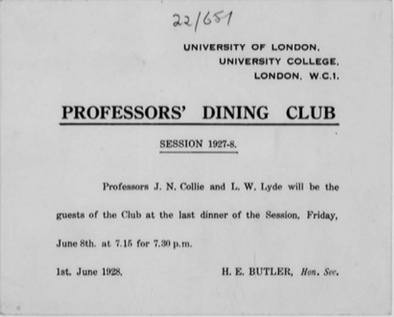 The Professors Dining Club is the oldest dining club in the College. The first dinner was held on 2 December 1876. The archives of the PDC are contained in a tattered cardboard box. It is a matter of regret that they are far from complete. We do not have a collection of minutes nor even a comprehensive set of rules. The last set of written rules we have been able to discover dates from 1896. At that time membership was open to “Professors, Assistant Professors, Physicians, Surgeons, Assistant-Physicians and Assistant-Surgeons to the Hospital, the Head Master of the School, and the Secretary of the College, and such other persons holding a teaching office in the College as may from time to time be elected at the October meeting”. Members had to pay an annual wine subscription of 12s.6d. The Club was required to maintain a cellar with minimum stocks of 6 dozen Claret, 6 dozen Hock, 6 dozen Port and 2 dozen Sherry - a curious combination. In 1981 the Club decided to admit women under the same rules as men, namely (1) Professors were automatically members of the Club, (2) men and women may be brought to dinners of the Club as guest of a member, (3) Academic-non-Professorial and Senior Administrative staff of the College may be elected to membership of the Club at the AGM provided that they had attended a dinner as a guest and were proposed and seconded by members of the club. It is an unwritten rule of the Club that guests should be invited for academic reasons. No person should be invited as a guest to more than one dinner in each session. The Club has its own cellar, which contains more than a thousand bottles.